Finalist of the Lovie Awards 2017! We need your Love! 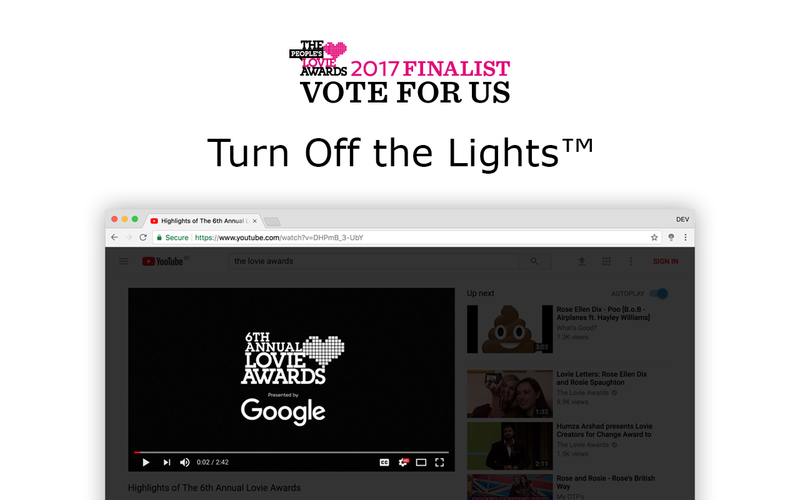 The Lovie Award announced that Turn Off the Lights Browser extension for YouTube and Beyond named finalist for best Websites, Web Services & Applications in the 7th annual Lovie Awards. This is a major achievement for as a Europe developer. It shows that Turn Off the Lights Browser extension ranks of the European Internet’s best and brightest. But we need your help to get there. We encourage you, your partner, your friends, your friends at work, family and neighbors to vote for Turn Off the Lights. Your support means a lot to us! This is a Major Achievement: What Does It Mean to Be a Lovie Awards Finalist? This is an unparalleled honour! This was The Lovie Awards most competitive season yet, with nearly 1,500 entries from 33 countries. As a Finalist, our work has been selected as among the best in its category and is in the top 20% of all work entered and now competes for Europe’s two most coveted awards: the Gold, Silver and Bronze Lovie Award, as chosen by the Academy in each category, and the People’s Lovie Award, voted on by the online public. These Awards are a mark of distinction for European Internet excellence.